A gentle walk in Wensleydale visiting the famous Aysgarth Falls and the villages of Castle Bolton and Carperby with an optional visit to Bolton Castle. Despite coming down with a nasty cough / cold I was determind to still get out over the weekend with some friends from work for a nice bit of Dales therapy. Without wanting to do anything too taxing I picked this gentle circular walk from Aysgarth Falls to Castle Bolton, a route that I’d not actually done since way back in 2004. Although the forecast was good it was still quite cloudy when we parked up at the visitor centre car park on the north side of Yore Bridge. Before starting the walk proper we took the path down to the picnic area above Aygsgarth Fall’s High Force, famous for its use in the film ‘Robin Hood: Prince of Thieves’. After viewing the upper falls we retraced our steps to the car park, crossed the road and entered Freeholders Wood. 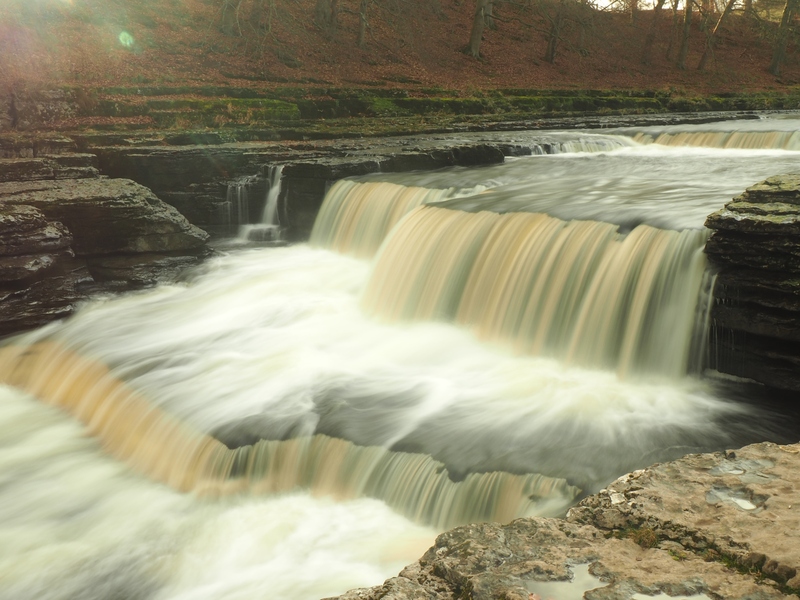 A couple of signposted diversions from the lovely woodland path took us to the middle and lower Aysgarth Falls just as the sun began to break through the cloud. Shortly after leaving the lower falls we left the woods behind to take a faint path leading to Hollins House and then on towards High Thoresby. Before reaching the latter we joined the end of the enclosed path known as Thoresby Lane. In places no more than a couple of feet wide and enclosed by hedgerows, Thoresby Lane is one of those paths that has the feeling of being an old way that has been in use for generations. Walking along it made me wonder how many other people over the years, decades and centuries had followed the same route. Eventually we arrived at the farm at Low Thoresby. From Low Thoresby we crossed another couple of fields to reach a junction on the Redmire to Carperby Road. Crossing straight over we took the turning leading up to the village of Castle Bolton which is completely dominated by the imposing remains of Bolton Castle. Although not a particularly steep or long hill I admit that I did struggle up into the village and I was glad for the opportunity to rest on one of the benches on the village green when we reached the top of the road. Although I was well wrapped up I was by now feeling a chill and was aching all over. This was due to the virus or whatever it was that I had rather than it being particularly cold. For the next couple of miles we followed a good track west from beyond the castle signposted for Askrigg. Contouring at a fairly modest height the path nevertheless featured some great views of Wensleydale. Pen Hill largely dominated the view to the south whilst further round to the west there was some lovely shafts of light breaking through the cloud at the entrance to Bishopdale. After passing Low Gate we took an initially faint left hand fork in the track to descend alongside Ponderledge Scar and join Peatmoor Lane. Turning left alongside this we dropped down into Carperby where we enjoyed refreshment in The Wheatsheaf. After leaving the pub the walk concluded with a simple stroll across a few fields and back through Freeholders Wood to the start. Although I certainly did not feel my best and my energy levels were low it was still nice to get out and just as importantly Kelly, Sam and Tony all enjoyed themselves as well. I really do feel blessed, not only to live close to such beautiful countryside but to have the opportunity to introduce to friends some of the many delights that can be found in the Yorkshire Dales.